By silencing genes two at a time in cells like these, the scientists can analyse the genes’ combined effects. In this microscopy image of human cells, nuclei are shown in red, cell membranes in green, and the cellular scaffolding in blue. To understand the connections between genetic make-up and traits like disease susceptibility, scientists have been turning to genome-wide association studies, in which they compare genetic variants of people with a particular disease to those of healthy people. Such studies have linked many genes to diseases, but these links were often weak and not clear-cut, possibly because individual genes often do not act alone. The effects of a particular gene can depend on what other genes a person carries, and the new method developed by the teams of Wolfgang Huber at EMBL and Michael Boutros at DKFZ enables scientists to uncover and measure those combined effects. The scientists took a set of genes that are important for cell signalling and, using a technique called RNA interference, silenced those genes two at a time, and compared the effect to what happens when you silence only one or the other member of each pair. In so doing, they were able to identify a new component in a cell-signalling process known as the Ras pathway, which is involved in cellular proliferation, and is known to go awry in tumour cells. If two people have many friends in common on facebook, the odds are that those two people know each other – even if they themselves are not facebook friends. Similarly, genes that have similar genetic interaction profiles are likely to influence each other’s effects, and Huber, Boutros and colleagues can now suggest such ‘friends’ – i.e. genes that are likely to affect the same cellular processes. In the long run, this could help predict patient outcomes and adapt treatments for diseases such as cancer. This project was supported by the CellNetworks Cluster, a novel institution at Heidelberg University supported by the Excellence Initiative (www.cellnetworks.uni-hd.de). Horn, T., Sandmann, T., Fischer, B., Axelsson, E., Huber, W. & Boutros, M. Mapping of Signalling Networks through Synthetic Genetic Interaction Analysis by RNAi. Nature Methods, Advance Online Publication 6 March 2011. DOI: 10.1038/nmeth.1581. 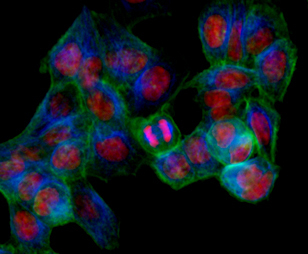 Picture caption: By silencing genes two at a time in cells like these, the scientists can analyse the genes’ combined effects. In this microscopy image of human cells, nuclei are shown in red, cell membranes in green, and the cellular scaffolding in blue.